Niagara Hospice and The McGuire Group's Northgate Health Care Facility have collaborated on a unique unit designed specifically for individuals receiving hospice care in a long-term care setting. The redevelopment of a 22-bed unit at Northgate, located at 7264 Nash Road in North Tonawanda, N.Y. 14120, was completed in early 2012. The collaboration is notably the first of its kind in New York State. The unit, affectionately named "Hospice at Jeanne's House - A Northgate and Niagara Hospice Collaboration" after a beloved Northgate employee who utilized Hospice services herself, is devoted to meeting the physical, emotional and spiritual needs of terminally ill residents requiring both 24-hour skilled nursing care and the unique services that only Niagara Hospice can provide. Residential care is co-managed by both organizations. According to a study sponsored by the National Hospice and Palliative Care Organization (NHPCO), only 6% of nursing home residents in the U.S. currently elect the hospice benefit, even though nearly one-in-four deaths in the U.S. occur in a nursing home. There are a number of reasons for this including the territorial nature of health care providers, conflicting regulations and Medicare reimbursement. The collaborative teams at Niagara Hospice and Northgate have chosen to take a more positive approach, working together to create medical protocols and an attractive and comfortable physical environment that can deliver a breadth of progressive, comprehensive services in a setting where it is needed the most. 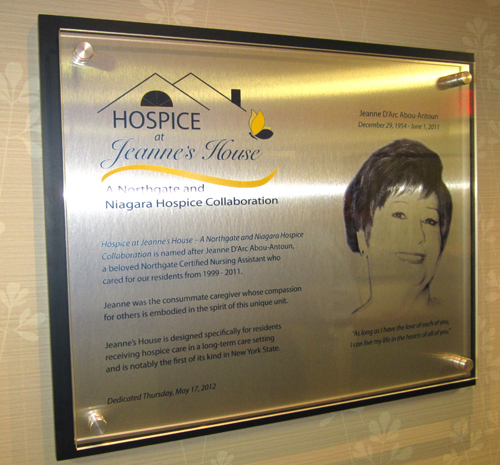 As a center of excellence for hospice care in nursing homes, the staff at Hospice at Jeanne's House - A Northgate and Niagara Hospice Collaboration has been specifically trained to meet requirements for providing this specialized level of care. The unit features beautifully decorated private and semi-private rooms; a lounge with access to an enclosed and furnished outdoor courtyard; volunteer companions; specialized therapies such as massage; music and pet visits; advance care planning and bereavement services for family members. Medical services include 24-hour skilled nursing care; IV therapy for pain and symptom management; pharmacy consultations; oxygen therapy; and other specialized services, as needed.